Another glorious weekend in London. The weather has been wonderful and it feels like summer is here to stay this time. On Saturday morning we joined the wonderful Isobel for a tour of Vauxhall. We had never been to the area and when we first arrived all we saw was a massive bus, underground, and train station. However, I’ve been on a few tours with Isobel so I knew we would be in for a treat. Up first the bus station. If you look at the photos below you’ll see some strange ski looking things on top of the building. There are solar panels in there and they supply one-third of the energy for this busy transportation center. One-third! Now I wish all businesses and residential places used solar energy. The animals, landscape, and planet would say thank you. Next we visited a small, but delightful garden in Bonnington Square. Before the garden was installed, this area had been hit by a bomb in World War II. Now it’s a wonderful place for kids (big and small) to play. The neighborhood on the way to our next stop. The Harleyford Road Community Garden. This is located near a busy street, but when inside you would never know it. In the 1970s it was a wasted space. The residents worked together to create this wonderful place for all to enjoy. 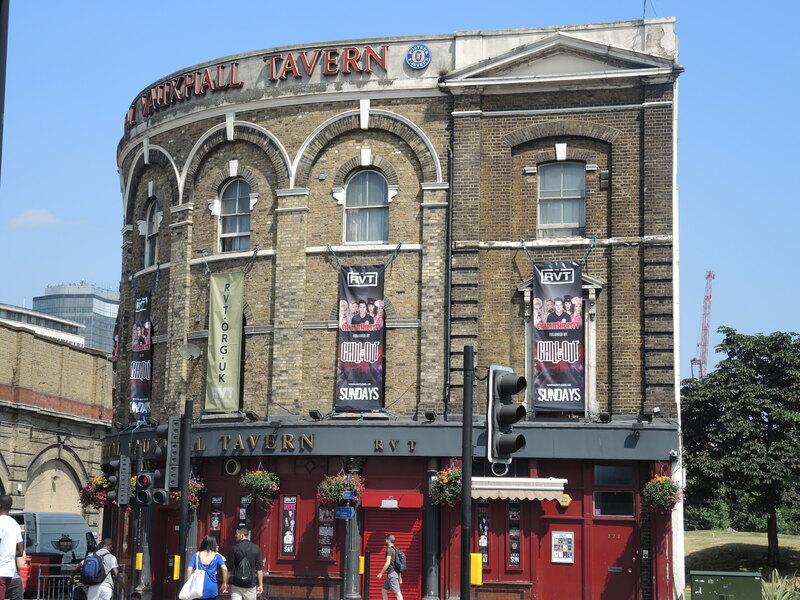 The Royal Vauxhall Tavern was erected in 1863. At first it was a Victorian music hall. After the war it became a venue for female impersonators. Many of London’s elite drag artists have performed here. And in the 1970s, Freddie Mercury would visit. The Battersea Power Station. This used to be a coal-fired power station, but now it is decommissioned. Many of you may recognize it though. It was shown in The Beatles’ movie, Help!, appeared in the Judas Priest video, “Another Thing Comin’”, and was used for the cover of Pink Floyd’s album Animals. This is St. George’s Tower. Many of you may have heard of an accident recently, when a helicopter hit a crane. This is where the accident occurred. Here is the Vauxhall Bridge, originally called Regent’s Bridge. It was built in the nineteenth century and was a toll bridge. Now it’s open to the public. Along the side you can see statues. Also, for trivia lovers. It was the first one in London to have tram tracks. This building, Peninsula Heights, might be of interest to book lovers. 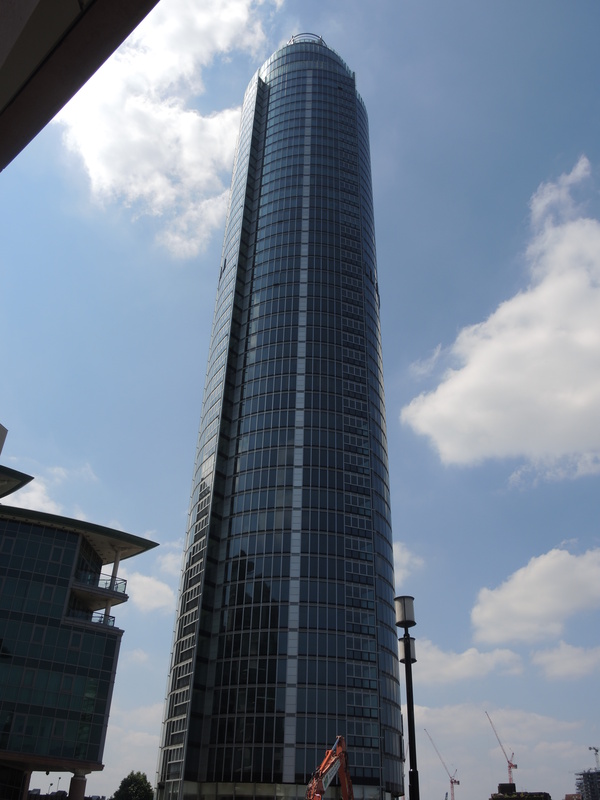 Jeffrey Archer owns the penthouse at the top. In addition it appeared in the Italian Job and in Sweeney. One of my favorite stops was the Vauxhall farms. I have to admit, I wasn’t expecting to see any animals on the tour and Isobel surprised me. We ended at this adorable tea place. Unfortunately we didn’t have time to have a cup of tea since we rushed home to watch Wimbledon. But I’m sure I’ll be back. For those who are in the London area or will be visiting, I highly recommend going on a tour with Isobel. Here’s her site. She’s an amazing guide and whenever I get a chance I go. In fact, I may repeat some of them. This entry was posted in Uncategorized and tagged 50 Year Project, Animals, Battersea Power Station, Bonnington Square, Drag Queens, England, Farm Animals, Freddie Mercury, Harleyford Road Community Garden, Help, Jeffrey Archer, Life, London, London By Guide, Peninsula Heights, Photography, Photos, Pink Floyd, Royal Vauxhall Tavern, St. George’s Tower, The Beatles, Tour Guides, Tours, Travel Blog, Travel Journal, Travel Photos, Vauxhall, Vauxhall Bridge, Vauxhall Farms, Walking Tours. Bookmark the permalink. Thanks, Scrapy. I hope you’ve been well! I hope nothing too serious. I was shocked how quaint and quiet the neighborhood streets are. You’d never expect it and I feel sorry for the folks who don’t venture past the station. There’s so much to see and the views are amazing. How’s the night life? do you happen to remember the street you were on? I’m sorry, no. I could probably find it if I walked there again, but at the time I was just following the friends I was with. We started out from Battersea Park, left the on the western side and walked (I think) in the general direction of the river, for about fifteen minutes. That’s all I can remember! Well it gives me more inspiration to go back and hunt for this spot. Will let you know if I find it! I love a good challenge. You are awesome! And that’s an interesting challenge you’ve set up for me. Let me think on it. I might enlist help to see if we can find the spot. Will let you know if I decide to take the challenge. I really enjoy these walks. I learn some history, feel acquainted with the neighborhood and learn to appreciate all that London has to offer. It’s nice to see places other than Big Ben–nothing against Big Ben. I’ve always been interested in the history of every day life and Isobel’s tours are perfect for me. Sounds like a wonderful day and I noticed there was even a tavern in there LOL!! yes I need to go back and take in a show at the tavern. Sounds like a wonderful time. you must come back and check out some of the comments here–TBM and I are talking about you! Wonderful weather for your delightful day. …. and I have that Pink Floyd LP! Cheers to Andy Murray!!!! 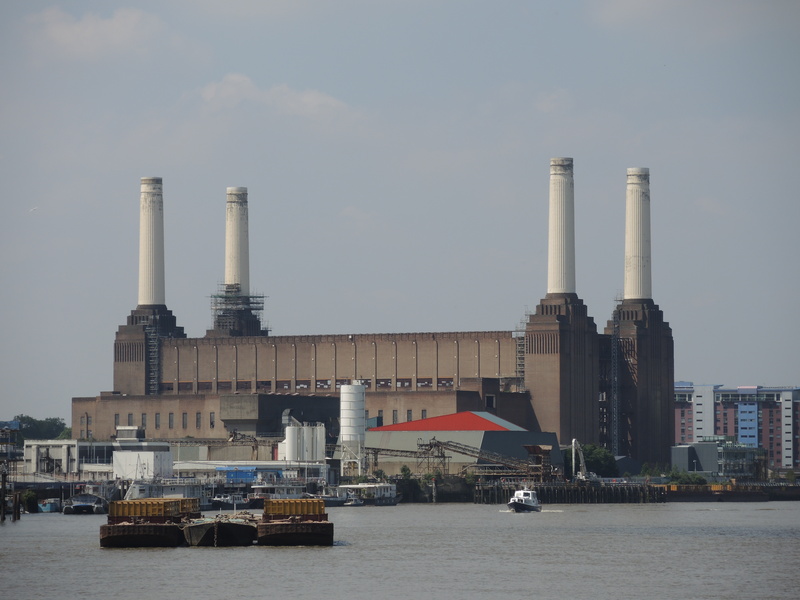 During the Murray match they showed the power station and I shouting, “I know what that is now! I’m a tea addict and I hear this place serves a legitimate cup of tea. It was a real shame that we didn’t have time to stop. But I loved the neighborhood so I know I’ll be back. And the greenery is amazing. I was astounded how quite the streets are considering it’s a main travel hub for buses. And the neighborhood community gardens really show how much people can transform and improve their living conditions if they work together. I wish more neighborhoods were like this. I did see many more cats, but they were much quicker and I couldn’t get their photos. What fun and it bought back happy memories as I have some pals who used to live in Vauxhall and we used to go to see some fun events at the Vauxhall Tavern! I bet the events were fun! I wish I could have seen it right after the war when it first started up. I wonder if there are any books on it. You’ll have to try the British Library, bet they have something. And the Tavern still has events now doesn’t it…you should go, it can get a bit wild! I’m pretty sure they still do events since they had banners hanging outside and I love shows. Must plan a trip! What an eclectic mix of visuals that are stunning and others that convey a slice of life. Do you consciously choose to do these genres? Thanks. Not sure how I decide what to take pictures of. I’m pretty much a snap and shoot person. I want to know why you are there and I am stuck here doing bookwork and reporting on drains? Drains, huh. My kitchen sink is draining slowly. Does that make you feel better? Would you like a full report? I see. I promise, I’m not flooding their fields. Can’t guarantee the downstairs flat, but I think Canada is safe from me. I do have special powers when it comes to drains, but not even I can flood a field on a different continent. hey now, you aren’t blaming me are you? What else has she said about me? absolutely and I will have her send you some chocolate to prove it! LouAnn!!! You weren’t supposed to say anything about the magic wand. TBM borrowed it from Harry Potter, and now Harry will probably get a howler from Hogwarts because he isn’t supposed to let anyone else use his wand!!! Now you’ve done it. LOL!! So I wasn’t supposed to see it on ebay. Now you tell me! I’m glad, Nia. Thanks for stopping by. He played very well and surprised me a few time with impossible shots that he made possible. Have never been to the area, so enjoyed seeing these shots. Also glad to see sunshine over there! The weather has been great, a little warm, but I’m getting used to it again. At least it isn’t as hot and humid as Boston. I hated the humidity there. Fascinating! It looks like it was a great weekend. I sure enjoyed your photos! I hope you do. This is an amazing place and I still have to remind myself that I live here now. I didn’t enjoy the process for getting my visa to live here so I understand. It was so stressful and quite intrusive into our personal lives. I understand why they have to be that way, but it is a pain. the problem is the british embassy in japan, it seems do not issue tourist visa since Japanese have no need for it. I think they can get it on arrival but not for me (being from the Philippines), so what they do is they send our passport back to my country for processing then back to Japan again , which is really troublesome. My partner is not a fan of London and my Brit friend is not planning to go back anytime soon, so its currently put on hold … for now. I hate red tape. When I moved to London I had to send my passport and other important papers and such in the mail. I hated that feeling of what if it got lost. I’m sorry this is such a difficulty for you. Hopefully someday it will be easier. Beautiful post and beautiful pictures, TBM! Glad to know that you had a wonderful time! Seeing skyscrapers in a London picture was interesting for me. Glad to know that you found a wonderful guide in Isobel. I checked out her blog and it looks great. It is odd and sometimes jarring to see the old and new buildings in London. I’m so glad you checked out her website. Isobel is such a wonderful guide and I would recommend her to anyone. i love this post. years ago i used to have an agonizing commute – 22 miles and it averaged 90 minutes on a good day. Vauxhall Road was the worst of it – that’s where my will power would break and i’d eat my lunch in my stopped car. now when hear Vauxhall or think of that road i’ll have all your lovely pictures in my head instead. I’m glad I could help. and 90 minutes for 22 miles. Oh man I can’t even imagine that kind of traffic and commute. How awful.